Designed to quickly check presence of voltage. 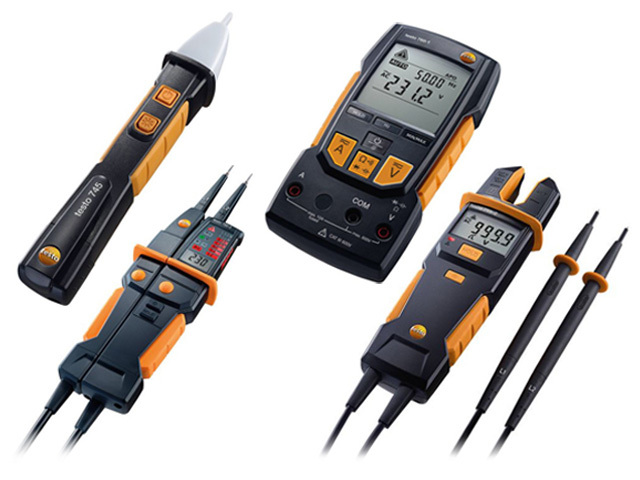 If voltage is present, TESTO745 warns the user with the use of visual and sound signal. Equipped with clear LED indicator, these voltage testers allow for reading measurements regardless of the measuring device orientation. The most important features are voltage and continuity testing. TESTO750-3 model allows for detecting direction of phase rotation and is equipped with additional LED display. Versatile, fully automated devices allowing for measuring AC current with the use of open clamps. They automatically detect parameter being measured based on the chosen input. Instead of a selection knob, they are equipped with function buttons. TESTO760-2 and TESTO760-3 models allow for measuring True RMS value and are equipped with a low-pass filter. Designed for contactless AC/DC current measurements (e.g. in control cabinets). One of the arms of the clamp can be completely pushed into the device enclosure. Unique cable-grabTM mechanism makes it possible to grab cables in tight control cabinets. Automatic detection of measured value guarantees the reliability of measurement.